So here's a question; how should an operational booster landing pad be constructed? The discussion I've seen assumes a big flat concrete surface, and it certainly looks like one for SpaceX test site, but really how would an operational pad that's getting blasted monthly and has a probability of an explosion need to be constructed? What supports and logistics needs to be out there? How much concrete (if concrete is the best material... porcelain tiles instead perhaps? ), and how deep does it need to be poured (perhaps to support returns of a larger 3rd generation booster too?)? How and where would the operators need to situate things like fuel handling and off-loading, emergency equipment, moving and logistics items. Does this get farmed out to a 3rd party logistics firm? What emergency supports and basic layout consideration is needed to support the inevitable (hopefully not) topple-over or hard landing and subsequent explosion of a returning booster? Traditionally, the possibility of a booster explosion taking out a pad has been handled by building more than one launch pad, and then rebuilding the destroyed one. In a high-volume commercial setting with lots of landings, and the possibility of much smaller explosions, this kind of thinking may not make sense. What post-flight safing and processing needs to occur with a booster there at the site, and/or later on (before the inspection phase)? Does an (operational) combination launch, landing pad even make sense, or are they entirely different beasts? These are all new planning questions for this industry! I'm looking at that photo of the SpaceX site, and thinking if that booster crashes or lands off target, even with just a little fuel in it, all those nearby support items are going to have a bad day. It's pretty ballsy to have all that stuff so close to the return pad for these experiments. They've got huge confidence in their ability to safely return the booster- and the off-course error ring gets larger the higher they fly it. That's a bunch of questions, and each one likely has lots of answers. BTW, thank you MeekGee for the attached landing pad image with captions. You missed the huge black burn patch right up against the support equipment though! Looks like they've got a firewall to keep it contained. I would think that they would want to put some water tanks and fire hoses there. I am quite surprised that they are not spraying the current pad with water as the F9R takes off and lands. It seems clear that SpaceX is following their usual iterative R&D process. Most of the focus about Spaceport America here on NSF.com has been about the testing to increase the envelope of the flight of the first stage. But I think they will use it to also test operations efficiency and answer some of the questions posed by sghill. I really look forward to pictures of their Spaceport America facilities, and then we can compare that to the picture in this thread.
" ... What supports and logistics needs to be out there? How much concrete (if concrete is the best material... porcelain tiles instead perhaps? ), and how deep does it need to be poured (perhaps to support returns of a larger 3rd generation booster too?)? ..."
From an environmental impact document, the McGregor test site used 185 cubic meters (242 cubic yards) of concrete for the pad. Colonel John Paul Stapp, MD. Formulated during those rocket sled experiments ... Stapp's Law: "The universal aptitude for ineptitude makes any human accomplishment an incredible miracle." The funny thing is that most of the infrastructure that supports F9R-dev launches and vehicle safing doesn't show up on the videos; they wheel it away before launch and wheel it back afterwards. Which is a policy they might well continue to keep the GSE out of danger from a crash, even if the collection of things on wheels has to get a whole lot more elaborate to deal with larger amounts of propellant and so forth. Largish Fondu Fyre surface, with whatever transponders, radar reflectors, or other support equipment is used by the Grasshopper/Falcon 9R to guide the returning booster to landing. A mobile erector that can rotate the booster to horizontal for transport/servicing. An extruded aluminum AM-2 style matting over a concrete surface seems like it makes sense for the landing surface, but I wonder if a screen door "hover pit" like VTOL aircraft sometimes use makes even more sense for a booster return pad. Seems like it'd be a whole lot easier on the reusable booster to allow the flames and heat to be diverted away during final approach. Gives more options for fire and noise suppression too. - A turnable pad so the rocket's hinges face the rail mobile exector's after rotation without the need for the crane lifting thus less prone to the winds. - An underground blast trench to one side. - An underground purging plumbing system to drain any remaining fuels after the rotation which lined up the fuel ports. - A flushed pop up fire sprinklers to soak the pad with foam or water in case of tank ruptured or explosive to reduce the damage to the pad's surface and structures itself, not the rocket, for quicker turn around. - A flushed retractable blast deflectors in certain location between the support structures and pad when needed. So would un-coated concrete. What design do you suggest instead? Non-heat coating concrete turns to steam lower than 1000C along with aluminum, but rocket exhaust is up north of 3000C. Porcelain, iron, and titanium melt at 1400C, 1500C, and 1600C respectively. A landing surface that diverts the gases, something that is ablative and regularly replaced, or something with a heat resistant coating for the minute or so the motors are firing during landings then seems to be in order as Jdeshetler said. And that's just the pad surface. I think that a lot could be done with a steel pad and water sprayed on it. The film of water would act like an "ablator". It would also be a medium for the metal to conduct the heat into in the areas that are not directly heated by the blast. It would only have to work for a few seconds anyway. concrete and water spray would be better. Whatever they make, it should be quite large to accommodate approach errors. I would make a HUGE concrete pad and give the rocket some room for error, so he would probably never land on the same place twice. I wonder how the mobile exector can hook up to this "hinges" or connections since the deployed (and fragile) legs is in the way? My assumption was that metal would be less brittle and less likely to crack when high temperature areas meet low temperature areas. 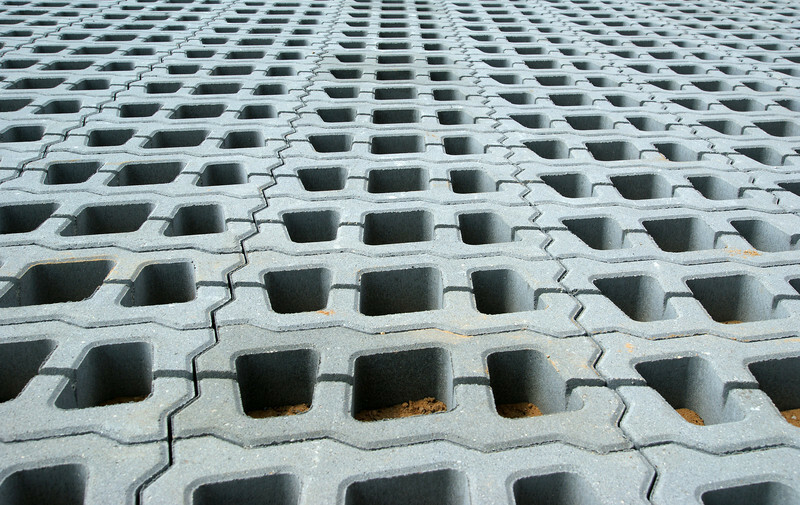 Expanding water in the pores of concrete could further facilitate cracking. I also assume that metal would be better at conducting the heat away from the hottest regions. I think that avoiding cracks (and resulting debris) is important to avoid damage to the engines from an unlucky ricocheting of debris created by cracked concrete. What is your take on it? Why do you think that concrete is better than steel? Is it the price of steel versus concrete? Does concrete have some physical property that I missed that makes it better than steel? This is an honest question, not me questioning your expertise. What about a concrete pad plastered with bricks like below and then flooded with water? The holes should prevent the water from being blown away by the engine exhaust like it would be with a smooth concrete surface. The end result would be the water evaporating and protecting the concrete bricks. If that is insufficient, alumina or zirconia refractory bricks used for steel manufacturing would definitely survive the rocket exhaust for a few seconds. They are not that expensive either. Might be awkward to put wheeled or tracked vehicles on, compared to a smooth surface. Or to land a rocket whose legs have narrow points of contact with the ground. In any case, let's remember that all this pad needs to handle for F9 booster landings is the heat from one throttled-down Merlin, which is the load that the pad at McGregor has already handled quite a few times by now, with both Grasshopper and now F9R-dev1. If plain concrete is holding up, there's no obvious need for something more exotic. These things are called "Rasengittersteine" in germany and are specifically made for parking lots. So normal car tires won't be a problem. The contact points of the rocket will be much larger than the holes, which are less than 10cm in diameter. Of course. But I would not call these bricks exotic. They are very common in germany to have parking lots with grass.